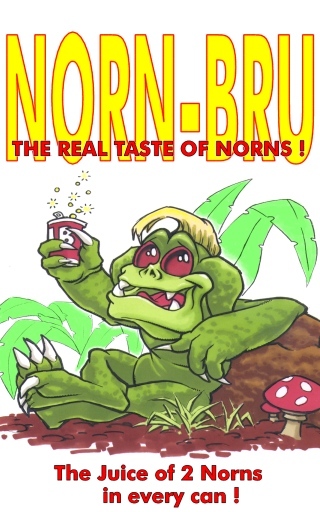 Norn-Bru is a fictional drink invented by RudeDog on alt.games.creatures in December 1997, and quickly made its way into newsgroup legend. A must-see illustration (also to the left) of the concept is available at Feral Farms, and there is a response to this and other norn products at Albian Critter Litter. Naturally, it was condemned by the Rights for Norns Society. Touted as having "The juice of two norns in every can! ", Norn-Bru is a great way to wash down some Norn Bread or Breaded Hatchling Norn. Available in Purple Mountain Norn, Forest Norn and Ron Norn flavours. This page was last modified on 11 July 2017, at 00:15.